Whittier Domains is an excellent resource that students at Whittier College can utilize to create professional webpages. There are numerous ways to design your webpage, and it can be overwhelming at some points. Hopefully this tutorial will help you get a better understanding of how WordPress works and how to optimize your webpage. Use keywords to describe what you want to convey on your website, relating to what content you want to be emphasized. After all, it is the first thing people will see when navigating to your website. This may lead to confusion and misunderstandings for people who hear your website name instead of reading it. You need to be able to make your name stand out among the millions of registered domain names. Make sure the name is not trademarked or copyrighted b another company. It could lead to a huge legal mess and cost you more than just your domain name. After logging into http://whittier.domains using your Whittier Username and Password, you will be taken to the Dashboard. The Dashboard is a page in which you can manage nearly every aspect of your website and its components. In order to install WordPress, navigate to the home page of the Dashboard, and scroll down until you see a subcategory of Web Applications. Here is where you will find WordPress as a featured application. WordPress is an open source blog application, and is the most used blog application worldwide. Using WordPress, you will be able to customize your website to fit your tastes and preferences. To install, simply click “install this application”, and follow the instructions. The most important part of your website is the layout. Some sites have one page, some have many, either way, the information you want to convey using this website should be presented in a visually pleasing and accessible way. In order to create a navigable website, having different pages for different types of content can be helpful. To create a page, click Pages on the toolbar at the left of your screen. Click Add New to create a new page for your website, and feel free to add whatever content you desire to this page. To set a page as your main menu, click the customization tab on the toolbar titled Appearance, and then select Menus. From this location you can set your main menu and determine which pages show up on your menu. 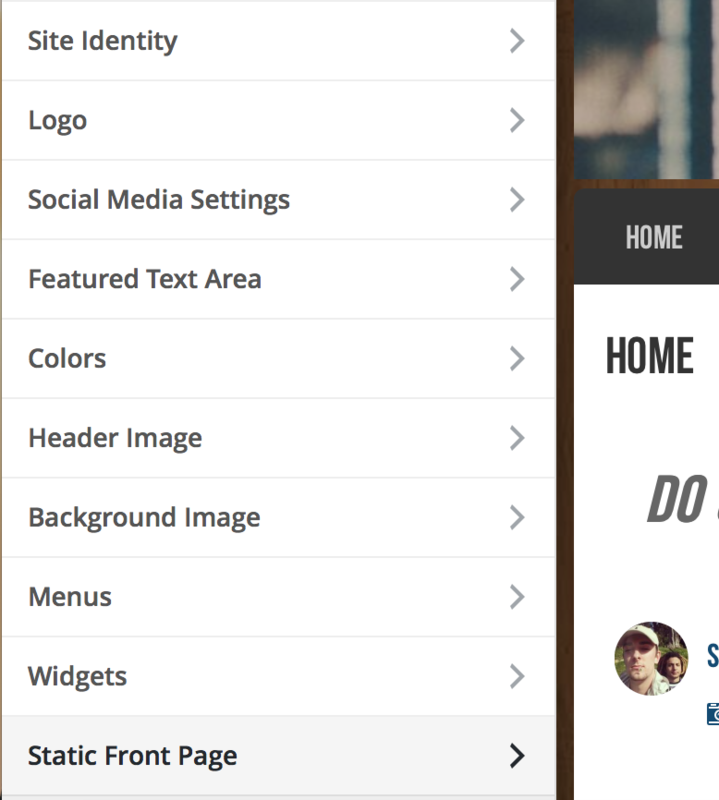 If you want to set a static front page, select the option Static Front Page from the customization toolbar, and then set which pages you would like to be the home page and the blog page. Keep in mind that some themes may not support some of the features discussed in this tutorial. Customizing your site is important to keep your audience interested when browsing the website. 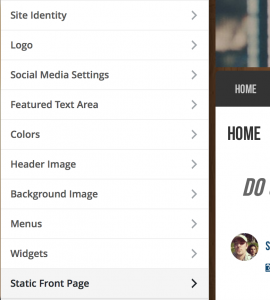 Luckily, WordPress has many themes that you can download and apply to your website (under the Appearance tab in your dashboard).. Keep in mind that some of these themes may restrict certain features and widgets. Under the appearance tab of your dashboard, you will see several options that allow you to tweak your site to fit your preferences. Play around with these options, and you’ll be able to make a professional looking website in no time! 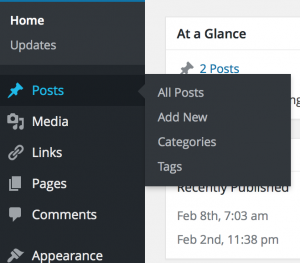 Under the Posts tab of your dashboard, you will find that you can publish blog posts to your selected blog page. You can post things that interest you like articles, websites, photos, etc. Your post page can be used to provide updates about your business or your own life! 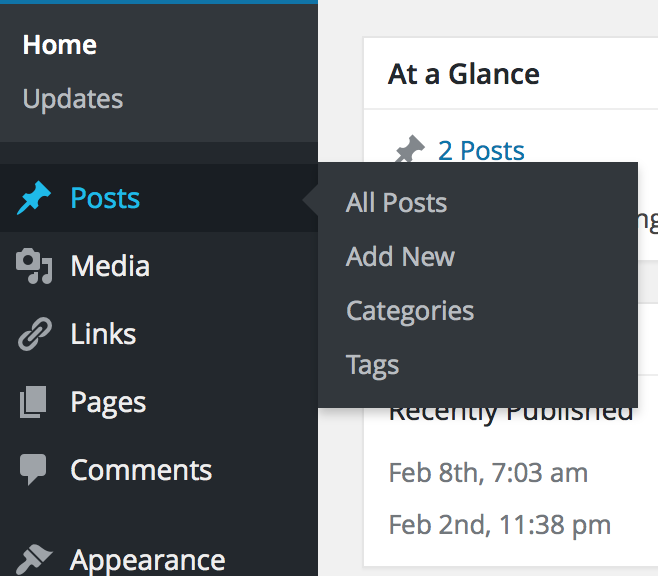 Posts will show up on the page that you designated to be your blog page in the Menus section (mentioned earlier). With this information, you should be ready to start your own website using Whittier Domains! Keep in mind, this information is just a way to get started, but there are so many more things that WordPress is capable of! If you would like to learn more, contact DigLibArts at dlastutech@gmail.com, and make an appointment to speak to one of the Student Tech Liaisons during the week, and they can walk you through any of the information above, and more!